Chef Daniel Tobien of Windigo Restaurant at the Fairmont Tremblant in Mont-Tremblant, Canada creates authentic regional cuisine that complements the spectacular mountain in the hotel's backyard. He shares an inspired taste of the region with recipes for Trout Filet from the Tremblant Reserve Cooked in a Verrine; and Reinvented Apple Pie with Vanilla and Pecan Glaze. Although talented Executive Chef Daniel Tobien grew up in Colmar, France in the Alsace region, after living in Canada for the past 17 years, and in Mont-Tremblant for the past 2 years, his heart is clearly embedded in the region. I met with Chef Daniel Tobien in February 2009 when I was staying at the hotel, and enjoyed getting to know this personable and passionate chef. 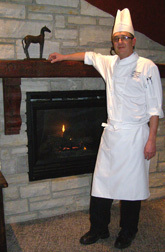 What Chef Daniel Tobien loves most about the area is the wonderful selection of regional products available including the fresh trout from the nearby lakes, the seasonal game that includes caribou in September, as well as venison, and wild boar; and uses lamb and chicken raised locally. He incorporates local cheeses, maple products, and ice cider (ice apple wine) in his recipes and tries to keep a very bio and green kitchen, something that is not always easy in a large hotel. He is trying to make a difference ecologically and works with a local farm that employs handicapped people, to compost the entire restaurant's produce waste. When not creating new recipes for the menu, which he changes 2 to 3 times per season, he enjoys fly-fishing for trout and even enjoys ice fishing in the winter, although he smiled when he said that his catch is strictly for home consumption. In his free time, he may also be found skiing the mountain with his 12-year old son, William. 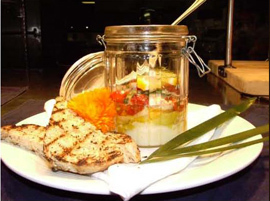 Method: At the bottom of the verrine (glass container with a glass lid), place the pare celery and potato purée, then the asparagus (lightly blanched), the trout, and finally add the crushed tomatoes on top of the trout. Cook submerged in boiling water for 15-20 minutes. Method: Sauté the apples with butter and brown sugar. Deglaze with the ice wine and then add the yogurt. Caramel Sauce Method: Make the caramel sauce from the butter, brown sugar, ice wine, and yogurt. Presentation: Place one cookie on a plate and pour some of the apple mixture. Set another cookie on top, and then add the rest of the apple mixture. Finish with the third cookie and glaze with the confectioner sugar. Place the pecans in the pan to coat them with the rest of the caramel. Add the vanilla ice cream to the plate and arrange the pecans on top of the ice cream. If you would like to add a little something extra to the decoration, place melted chocolate in a squeeze bottle to make a zigzag design. Voilà! Windigo Restaurant is open for breakfast, lunch, and dinner. Read about Windigo Restaurant in the Restaurants section and about the Fairmont Tremblant in the Hotels and Resorts, and Spas sections. Read other articles on Mont-Tremblant in the Destinations, Hotels and Resorts, Spas, Restaurants, Chefs' Recipes, and Adventures sections. For more information on Mont-Tremblant and upcoming events, please visit the websites: www.Laurentians.com and www.Tremblant.ca. For information on Quebec, please visit the website: www.BonjourQuebec.com. For information on Continental Airlines service to Mont-Tremblant International Airport, please visit the website: www.Continental.com. For information on the Airport Shuttle Schedule from the Mont-Tremblant International Airport to Mont-Tremblant hotels please visit the website: www.MTIA.ca. © March 2009. Luxury Experience. www.LuxuryExperience.com All rights reserved.